The Skocian Empire has lauched another invasion, this time to the distant colory of Charen. The Charen separatists continue to resist Skocia's prefessional legions through a mysterious technology known only to a few--a technology that once plundered will make the Empire invincible. Professional gambler, martial artist and renegade lawyer, Marcus Bass, cares little for Skocia's war. However, he cares a great deal for what a portion of Charen's plunder will gain him in his personal war against the Skocian Consate: and more singularly, his half-brother: Senator Hayden Bass, the Lord Arc Rhegma. His quest takes him to Charen's shores, and unexpectedly into the heart of Charen's intelligence network where he wakes with no memory of his past and no knowledge that he is an infiltrator on a mission to destroy their civilization. Shortly returned from the edge of death, Marcus finds himself face-to-face with Charen's fabled King. Soon he will stand on the shore of a decision that will determine the destiny of the universe. 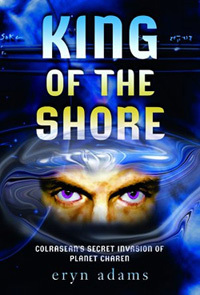 King of the Shore has been called the first of a new literary genre: Christian Science Fiction Novels. Although fantasy enthusiasts will enjoy the adventures on planet Charen, King of the Shore is genuinely sci-fi at the core. Readers who enjoy the classic C.S. Lewis inspirational science fiction Space Trilogy: Out of the Silent Planet, Perelandra, and That Hideous Strength will relate to Eryn Adams' other-world perspective on the universal nature of God as the omnipotent creator of heaven and earth. Likewise, readers of The Lord of the Rings fantasy novel trilogy will appreciate Adams' insight into the inward journey of becoming something greater than "oneself" through faith, unity, and commitment. Readers of The Robe by Lloyd C. Douglas, Ben-Hur by Lew Wallace and fans of all the Frank Peretti Christian science fiction books will find a great reading adventure in King of the Shore. 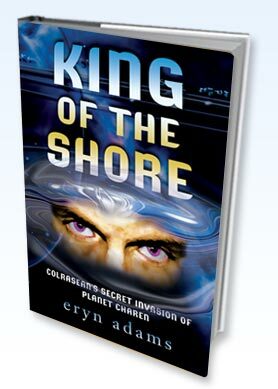 Eryn Adams began writing the initial concept of the science fiction novel, King of the Shore, as a seventeen-year old who had many questions about faith, friendship, love and Christian fellowship. This was during the tumultuous 60s era in American society when cultural norms and faith in God were being shaken to the core. This great science fiction book was not written until over twenty years later. It wasn't until 1993 that the sci-fi book was edited by the beloved Marjorie Ainsborough Decker and Kevin Decker of the Top Ten Christian book bestseller Christian Mother Goose and subsequently published by Hartway-Miller Publishing. 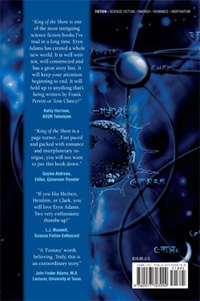 Much of the sci-fi author's personal journey of faith emanates between the lines in this science fiction romance; thus many readers have repeatedly commented: "It seems so real," because it is: a journey of a soul that many spiritual "pilgrims" share—mixed with interstellar intrigue, romance and adventure. Does Jesus Christ exist beyond the frail borders of our small universe? Can we see him beyond the stained-glass of what we call church? If we took away every cultural influence and preconceived idea of him, and saw him as he is in the midst of his creation, what would he look like? Isaiah says in Isaiah 6:1: In the year of King Uzziah's death I saw the Lord sitting on a throne, lofty and exalted, with the train of His robe filling the temple. Isaiah was so overwhelmed he could not speak. Well known scientist Carl Sagan and his team created the NASA Golden Disk that is catalogued in his book Mummers of Earth, that was launched on the Voyager mission in 1977. Trinity Broadcasting Network has sent the inspirational message of the Son of God outward across this small solar system we call home. Its Sky Angel Satellite has delivered an infinite message of hope, love and salvation to what appears to be empty space. Who knows who could be listening? King of the Shore, a Christian science fiction novel, has been called controversial and has been rejected by much of mainstream Christian publishing. The president of a well-known Christian publishing house remarked after reading King of the Shore that he was very impressed with the book, but had no way to promote or distribute this Christian sci-fi book...and had the author written anything else? At the same time, the ministry of phenomenal research scientist Dr. Hugh Ross, Reasons to Believe Ministries: Integrating Science and Faith, embraced King of the Shore and made it available at their book tables. Oral Robert University made King of the Shore available in their campus bookstore, thanks to the deeply appreciated support of Roberta Potts. King of the Shore was acquired by Vision-Quest Publishing. Our special thanks goes to Braden Brown (aka Dox Brown), artist extraordinaire and "mad scientist" for his amazing cover art. Visit "Dox" Brown at doxbrown.deviantart.com. Heartfelt thanks goes to Dr. Andrew Linick of The Linick Group for his incomparable imagination, energy, and talent in executing the new cover design and lending his remarkable marketing expertise. Tremendous thanks goes to Becca Wilson, President and CEO of Spherexx.com: visionary, mastermind, philanthropist, fearless leader, and friend without whose generosity and faith, this sci-fi fantasy book would not have been so beautifully represented. *ktísis — basically cosmos: properly, creation (creature) which is founded from nothing (this is also the sense of this term from Homer on); creation out of nothing (Lat ex nihilo).